Before getting on with the show, it is important to note that email marketing is not a labor to be taken lightly. There is, in fact, much more to email marketing than simply collecting email addresses and sending out the occasional reminder. The ongoing commitment to this unique correspondence can be quite time consuming, but the rewards can be grand, too. That being said, email is a superior marketing medium in which to focus your company's efforts because it's proven effective and is relatively inexpensive. It is crucial, however, that a sign-up form be in a conspicuous place on your website, as well as on your blog and in social media outlets (consider asking for a birthday in order to send out special offers when birthdays roll around). If you have something to and can say it well, with brevity and clarity then email marketing can very well be the ideal channel for staying connected with existing and potential customers, and tempting them to share your content for you to an entirely new stream of people. However, if you want email marketing to really pay off, then honesty, consistency, quality, and succinctness are essential. One of the best ways to lay everything out on the table from the get-go is the Welcome Letter your chance to show integrity and explain your company's intentions. In such a letter, you can provide some insight as to how often subscribers should expect an email (once a week is pretty standard) and assure them you will not sell or distribute their information. Brush up on the CAN-SPAM Act if you're unsure of the laws regarding email messages in which a commercial product or service is being advertised or promoted. This next bit is of utmost importance: Make opting-out as clear as day by offering an easily recognizable, readable, and understandable explanation of how to unsubscribe an important show of that honesty mentioned previously. By including a healthy dose of identifiable qualities that display your company's look and feel in every email, you boost brand awareness and integrity. This includes email headers, font colors, logos, and perhaps even a signature sign-off. Don't underestimate the power of design and, furthermore, consistency in that design. Stick to one topic at a time, and plan each email layout with succinctness in mind. It's a huge turn-off to be overbearing with the amount of information being presented at once. Emails are more of a scan-and-move-on type of communication, so don't assume you have plenty of time to divulge and explain the purpose of the content. You can always include a Read More link if necessary. Also, an insightful and meaningful title in the subject line of each email will keep it from winding up in the trash or spam folder. A quick Google search for spam trigger words to avoid will yield hundreds of examples of words not to include. Again, this next bit is of utmost importance: Make all emails mobile-friendly. Seriously, do it you'll be thankful you did. Just imagine the number of people who now regularly check their email on-the-go. Since emails tend to be more casual, there's no harm in using the same tone and voice as you would in a blog post or during conversations with customers. But to remain professional, always use an editor better yet, use a team of writers, proofreaders, and editors. Grammar mistakes are your enemy, making your company look amateur and unworthy of others' time and business. Meanwhile, a good and consistent style is your best friend, providing readers with a sense of security and loyalty stemming from your noticeable efforts to make all information clear, concise, relevant, and qualified. It's often best to determine early on whether or not your emails focus more on reminders and notifications, or on offering discount codes and special offers, or a combination of the two. In other words, don\'t make too many promises, and don\'t lead your subscribers to think that a wealth of savings is in store with each email they receive. 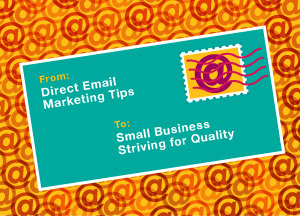 All of the facets detailed above are integral for quality, and quality is something that entices people to share your unique content, which will undoubtedly help to maximize your company's email marketing efforts. Keep em coming back for more!